• President Donald J. Trump violated international law by summarily and unilaterally firing 60 tomahawk cruise missiles at the sovereign nation of Syria on Thursday, April 6, 2017. • Trump ordered this illegal attack without a United Nations Security Council resolution. He also violated the War Powers Act, an impeachable offense. • Trump violated the U.S. Constitution by committing an unprovoked act of military aggression against a sovereign state that posed no threat to either the United States or its allies by mutual defense treaties. • Trump based his decision to launch this unlawful and deadly attack on a patently false accusation that the Syrian Government perpetrated a chemical attack against its citizenry. • Trump took this unconstitutional decision to invade Syria without even a preliminary investigation of the gas attack by the UN, the Syrian Government or any other competent party authorized to do so. • Trump and his military advisors failed to consider the volumes of evidence which pointed directly to a false flag chemical attack conducted by so-called Syrian rebels, ISIS terrorists and/or Al-Nusra mercenaries. 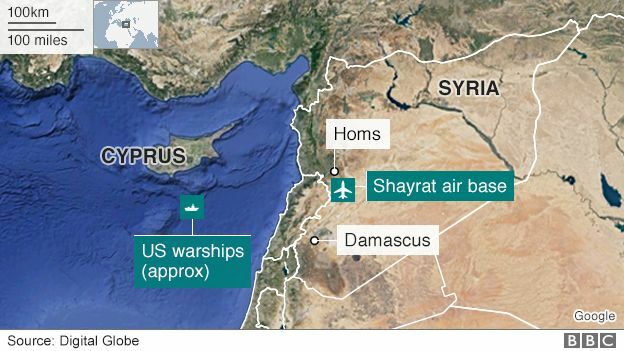 • As Commander-in Chief of the U.S. Armed Forces, Trump is directly responsible for the 15 deaths (6 soldiers, 9 civilians) who were killed by this missile attack on the Shayrat Air Base in the Homs Governorate, Syria. Therefore, he is now a war criminal just as many other U.S. presidents were set up to be at the start of their terms in office. Why did trump go ballistic—literally? Why did he commit such a blatant war crime? #1 — President Bashar al-Assad, working in tandem with the Russian military, has made great gains in taking the country back from ISIS and Al-Nusra terror groups. Peace accords were being negotiated wherever possible and a turning point was becoming realistic. This was occurring in direct competition with the Greater Israel project whereby the entire Northern Levant has been targeted by the Western powers using NATO as the cat’s paw. The West only wants the chaos of war to predominate throughout the Middle East so that Greater Israel will be established to control the whole region. Both the false flag chemical attack and subsequent missile attack by the U.S. have served to significantly thwart the delicate peace process. #2 — Trump’s naked war crime was especially committed on behalf of Israel. An Israeli F-16 fighter jet was recently shot down over Syria which is never tolerated by the Jewish state. Simply put, no one shoots down an Israeli warplane and gets away with it—EVER. Their reflexive retaliatory measures always produce a favorable outcome on the order of at least 10 enemy to 1 Israeli per Talmudic Law. The F-16 was actually shot down on Friday, March 17, while a second fighter jet was also hit on their way to Palmyra. Apparently Israel really hates getting caught in the act of aiding the Daesh terrorists who have been beaten badly all over Syria by Assad’s forces. Israel’s aerial assaults are “a desperate attempt to raise their (Daesh terrorists’) deteriorating morale and divert attention away from the victories which the Syrian Arab Army is making in the face of the terrorist organizations,” the statement read. #4 — Then there are the Zionists, both Jewish and Christian. Each group has a different political and religious agenda. The Jewish Zionists (JZ) see the world through the fulfillment of their prophecies which somehow means that they will be granted the undisputed rulership over the traditional Levant region. The Christian Zionists are being cynically used by the Jewish Zionists to accomplish that preposterous goal. 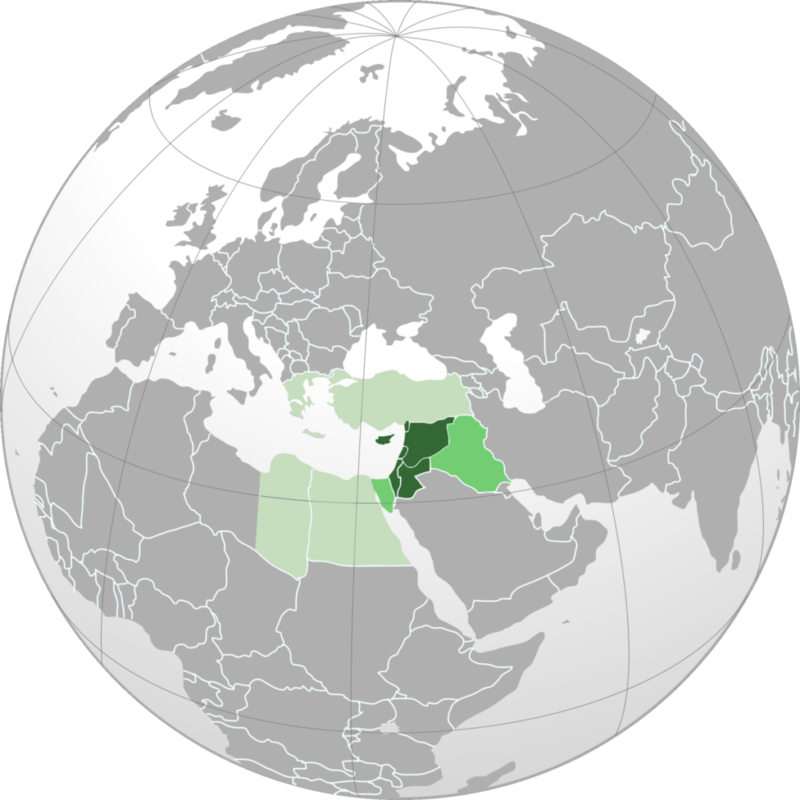 The following map highlights those geographic areas which have been considered parts of the Levant down through the centuries. What becomes quickly apparent is the degree of chaos and mayhem that currently exists in each of the Levant nations. Being at the crossroads of the world from time immemorial has made this particular piece of real estate the most coveted on the planetary monopoly board. Hence, everybody and their brother, wants a piece of the Levant pie. #5 — “Damascus is widely believed to be the oldest continuously inhabited city in the world, with evidence of habitation dating back at least 11,000 years. Its location and persistence have made the city a nexus for civilizations come and gone. Today its metropolitan area is home to about 2.5 million people, and in 2008 it was named the Arab Capital of Culture.” Because of this extremely significant distinction, Damascus has become the target for the NWO globalist cabal. This is precisely why they created ISIS, ISIL and the regional Islamic State terror network. Notice how the terrorists not only terrorize the indigenous peoples off of their ancestral lands, they also destroy the local monuments and architecture after stealing all the ancient artifacts. In this way Arab culture is slowly being destroyed while true Islam is being corrupted by clandestine plots conceived in Tel Aviv and Riyadh and overseen in London and Washington. #6 — Donald Trump sent a HUGE message of “shock and awe” with this wholly misguided attack on Syria. The cavalier manner and inappropriate time that he ordered the missile strikes while hosting China’s head of state shows his complete lack of diplomacy and détente. If such a shocking display of militarism was meant to — in any way — intimidate President Xi Jinping, Trump was sadly mistaken. Likewise, if such an aggressive gesture was meant to foreshadow a replay of the Iraq War in Syria, Trump does not know who he is dealing with in the person of Bashar al-Assad. He also must know by now that Putin’s Russia will not be threatened for a single moment by such juvenile saber-rattling. President Trump ought to get in the shoes of every head of state who just witnessed his wildly immature outburst. Both he and his advisors who approved those illicit missile strikes really need to ask themselves the question: How would they receive the news that 60 tomahawk cruise missiles were fired at Wilmington, Delaware by Iranian warships perennially parked off the Atlantic coast? The following map illustrates just how provocative and dangerous such a foolhardy move was. Obviously Trump was not thinking about any of this and was given direct orders to attack by those who really control him. Who really controls the main Trumpster? All of the pre-attack moves and maneuvers indicate that the POTUS has been completely taken over by the Zionist Neocon cabal. There were several indications that this is the case. The most significant of these is the steady elevation of his son-in-law Jared Kushner within the Administration hierarchy. This young kid and very green political upstart just keeps getting bigger by the day. How does that happen except by quite purposeful design? Clearly, Kushner is the key to keeping Trump on the Zionist reservation. Having strategically married Ivanka, Trump’s fav daughter, this marriage, too, was by deliberate design. This is the way that Jewish power has always infiltrated the ‘royal families’ and ruling dynasties over millennia. The quickest way to become a royal is to marry one. Jewish Zionist Prince Jared married Christian Zionist Princess Ivanka who, incidentally, has already been identified as the one who convinced The Donald to attack Syria. Donald Trump carried out Syria missile strike ‘after being convinced by daughter Ivanka’ And who, pray tell convinced Ivanka but her Zionist Neocon husband. Now here’s the real problem with the Trump presidency. Trump repeatedly presented the primary plank of his campaign platform as such that he was not for war in the interest of MAGA (Making America Great Again). It now appears that he pushed this slogan merely as a façade to gain votes knowing that he would carry water for both Jewish and Christian Zionists. Carrying water for Zionist enterprises always translates to perpetual war throughout the Levant. Their most sacred cow and implicit purpose is the completion of the Greater Israel project. The practical matter regarding Donald Trump is that he has always been beholden to Jewish Zionist bankers and lawyers. Roy Cohn, one of the most influential lawyers in New York City in his day, took The Donald under his wing after he moved to Manhattan. This successful relationship quickly showed him that the way to get ahead — real fast — was to surround himself with Jewish Zionist lawyers and bankers. Which is exactly what he has done since entering the Oval Office. Not only is his oldest daughter a convert to Judaism, both Trump sons married Jewish women. Eric Trump married Lara Yunaska in a Jewish ceremony performed by Jared Kushner. Likewise, Donald Trump, Jr. married Vanessa Kay Haydon, the daughter of Ashkenazi Jewish lawyer of Austrian Jewish and Russian Jewish descent. When the 3 oldest children of Donald Trump go in the same religious direction, away from their Christian roots, it’s quite likely that it will be very good for business. There’s an old Mideast yarn that goes like this. The Rothschilds, and other major power-brokers who established the Modern State of Israel, adhere closely to a strategy of co-option concerning every willing player. In other words, Zionist Neocon bankers will fund your enterprise liberally — NO MATTER WHAT IT IS — as long as you fully support their apartheid state. Likewise, Jewish lawyers will keep litigation far from your business and home if you enthusiastically support the Zionist movement. In the presidency of Donald Trump, the nation has just experienced yet another takeover by the Zionist Neocon warmongers. Working under the direction of the NWO globalist cabal, the final regime changes in the Mideast will be implemented with all deliberate speed. These incorrigible warmongers will stop at nothing until the entire Middle East and Northeast Africa have been transformed into a dystopian, post-apocalyptic wasteland. For it is only in such a chaotic and fractured environment that the Greater Israel project can be stealthily completed. The Trump family has been fastidiously prepared over decades for this long-planned Israeli mission, just like the Bush, Clinton, and Obama families were. Nothing has really changed in American government with the Trump administration except the name of the new political dynasty (in-the-making). Of course, the rite of passage for every new U.S. President is the commission of a flagrant and unmistakable war crime on behalf of the rogue nation of Israel. Hence, it appears that — with the criminal bombing of Syria — the new POTUS has just had his political bar mitzvah.